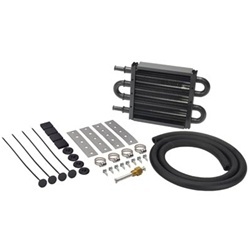 Fluid Cooler, Copper Tubing and Aluminum Colling Fin, Extends Pump Life, Reduces Heat Of Hydrogen Generator, and Heat Related Pump Failure, Includes Complete Installation Kit 5 in. x 8.125 in. x 0.75 in. Overall Height (in) 5.000 in. Overall Thickness (in) 0.750 in. Overall Width (in) 8.125 in.